The 2011 Ford Expedition XL ($35,590) and 4WD XL ($38,490) come with cloth upholstery with front captain's chairs, second-row 40/20/40 split bench reclining fold-flat seat with CenterSlide, third-row 60/40 split bench fold flat-to-the-floor seat, full-length overhead console, large center console, power door locks, power windows, heated power mirrors, carpeting, auto-dimming mirror, three power points, leather-wrapped steering wheel, cruise control, keyless entry, AM/FM/CD/MP3 with audio input jack, fog lamps, luggage rack, and 17-inch aluminum wheels. The Expedition EL XL ($39,115) and Expedition EL XL 4WD ($42,015) are equipped the same. Options include SYNC voice-activated communication and entertainment system ($395), heavy-duty trailer towing ($395), and remote start ($345). The Expedition XLT ($38,200) and XLT 4WD ($41,100), Expedition EL XLT ($40,910) and EL XLT 4WD ($43,810) add reverse-sensing system, SYNC, Premium sound system, power-adjustable pedals, universal garage door opener, and a large selection of other trim and convenience features. XLT options include moonroof ($995), power running boards ($995), air suspension ($485), rear-seat entertainment ($1,995), leather ($2,265), and voice-activated navigation ($2,105). The XLT is also available with three comprehensive packages with increasing levels of features, the 201A ($4,425), 202A ($5,610), and 203A ($9,705). Expedition Limited ($44,870) and Limited 4WD ($47,770), Limited EL ($47,520) and Limited EL 4WD ($50,420) add heated and cooled front seats, power rear quarter windows, dual-zone climate control, memory for driver's seat and exterior mirrors, rear-view camera, rain-sensing wipers, power liftgate, PowerFold rear seat, leather, 20-inch alloy wheels and a wide range of additional convenience and trim features. Limited Decor Group 301A ($4,590) features navigation system, rear-seat entertainment, moonroof, and power running boards. Expedition King Ranch ($46,140) and King Ranch 4WD ($49,040), King Ranch EL ($48,790) and King Ranch EL 4WD ($51,690) feature Chaparral leather upholstery, King Ranch badging, and gold exterior accents. The leather trims the center console lid, steering wheel and door panels, while wood trim can be found on the center console, shifter handle and instrument panel. There is also a King Ranch Decor Group 401A ($4,590), which includes navigation, rear-seat entertainment, moonroof, and power running boards. Safety equipment includes front airbags, torso-protecting front side airbags, three-row head-protecting side-curtain airbags with rollover deployment, tire-pressure monitor, anti-lock brakes (ABS) with brake assist, and AdvanceTrac electronic stability control with Roll Stability Control (RSC) and Trailer Sway Control. A rear obstacle detection system is standard on Limited and King Ranch. This third-generation Expedition features a three-bar grille, large headlights, and a domed hood that combine to deliver a look that's both distinctive and respectable. There are several different wheel designs, including 20-inchers with a chrome finish. 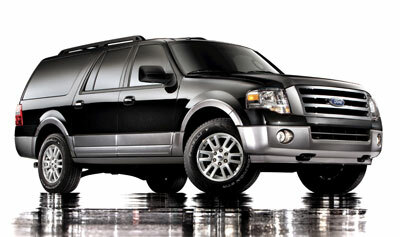 The Expedition rides on a wheelbase of 119.0 inches, while the EL models stretch that to 131.0 inches. Overall, the EL measures 14.8 inches longer than the standard Expedition, and that adds slightly over 22 cubic feet of cargo volume, from 108.3 cubic feet for the Expedition to 130.8 for the EL. They're also heavy, as even the base 2WD Expedition weighs almost 6,000 pounds, and a loaded EL with 4WD will be comfortably over that. The Expedition's liftgate with its flip-up glass hatch makes access to the cargo area very easy. The Expedition's second- and third-row bench-type seats fold flat into the cargo floor, affording a long cargo area that can be easily loaded. This means you don't have to unbolt the passenger seats and leave them on the floor of your garage every time you're making a serious run to the home improvement store. In this regard, the Expedition is much better designed than GM's large SUVs. The Expedition is also available with an optional power-folding third-row seat and electronically powered liftgate to make it even easier to load cargo. However, the seat cushions of the second- and third-row seats are a little slim in order to allow the seats to fold properly. Full-size sport-utilities aren't known for their driving manners, but the latest-generation of vehicles from both Ford and General Motors offer real progress in delivering a more car-like impression. In this regard, the Ford Expedition tracks down the highway with excellent straight-line stability, negotiates forest roads with surprising agility, and absorbs impacts from bumps or broken pavement without straying from its path. It maintains a surprisingly calm ride considering its truck heritage. Most of the advantage comes from the synergy between a rigid frame, high-pressure gas shocks that afford excellent wheel control, and a second-generation, link-type independent rear suspension. The Expedition makes an excellent tow vehicle. With the optional towing package, the standard 4WD Expedition is rated at 8,900 pounds, the 2WD at 9,200 pounds, the 2WD EL at 8,900 pounds, and the 4WD EL at 8,700 pounds. We've found the load-leveling air suspension works very well. Using a weight-distribution hitch, we found the Expedition relatively smooth and reasonably stable while pulling a 24-foot trailer with two race cars stacked inside along with tools and spares, and three adults riding in the cabin. Head/hip/leg room, f: 39.6/60.2/41.1 in. Head/hip/leg room, m: 39.8/59.9/39.1 in. Head/hip/leg room, r: 38.3/50.2/37.7 in. Cargo volume: 108.3 cu. ft.